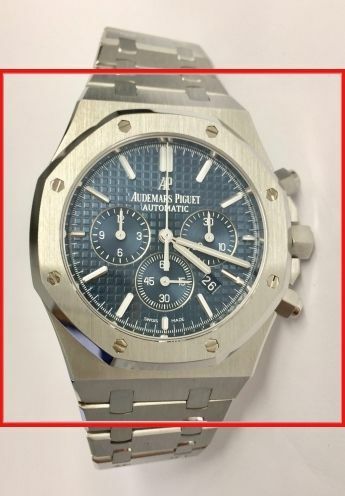 This dynamic Audemars Piguet Royal Oak 26320ST.OO.1220ST.03 sports watch fascinates athletes or simply sports enthusiasts alike. The Audemars Piguet Royal Oak 26320ST.OO.1220ST.03 sports watch is characterized by its dynamic design, robustness and functionality which athletes but also leisure athletes expect and seek. The dial of this very sporty watch is Color blue, Guilloché, Rhodie applied markers and the bezel is Stainless steel, brushed bezel, Polished. The sports watch comes with a Power reserve 40 h, Côtes de Genève pattern, Half-oscillations A/h 21600, KIF Elastor anti-shock protection, Mechanical movement self winding, caliber 2385, 37 jewels, 40 hour powerreserve movement. The Stainless steel, Rubber bracelet is designed for sporting activity and durability. The functions of this sports watch include Chronograph, Date, Second stop, Hour minute, Central second. Find more sport watches in our category of sportive watches. Take a closer look at our Audemars Piguet luxury sports watches. You will quickly see why it is one of the bestsellers in our extensive range of luxury watches. Discover the world of Audemars Piguet watches and learn more about Audemars Piguet on the Manufaktur Webseite. Take a look at our other exclusive luxury watches and see why Audemars Piguet and other watch brands are so seductive. Rattapante is a leader in the online luxury watch market. From new, unused to used watches, we offer only the highest quality watches, including the Audemars Piguet Royal Oak 26320ST.OO.1220ST.03.